Day 3 in our Washington, DC trip starts off in true Running in a Skirt style with a 3 miler in Georgetown. When I first booked the trip a group run was the first thing I put on my agenda. You may remember both Sarah and Beth from their guest posts on Running in a Skirt. Both of them have been runners since High School and it is so much fun to now all share the same hobby. We get up early and drive from their condos in Arlington to this beautiful trail along the river. The views are so pretty and it doesn’t even feel like we were running in a big city. Beth really knows the area running routes and tells us how this trail goes out and back for MILES! I highly recommend the Chesapeake and Ohio Canal National Historical Park for running if you are in the area. After a quick breakfast and shower, we regroup and drive to the OTHER big Smithsonian Air and Space museum at Dulles airport. The second museum carries even more planes and spacecraft that can’t fit into the downtown location. The hubs loved the first museum SO MUCH that when we hear about the annex we have to go. And boy are we impressed! We see a Corsair. And a F-14 Tomcat (Plane from Top Gun) I feel the need! The need for speed! The capsule Felix Baumgartner jumps out of from space. The “Worlds Smallest Plane” AND… the Space Shuttle Discovery. We had just seen Atlantis at Kennedy Space Center in January so it feels really cool to see one more of the remaining space shuttles. The last one is on display in California and we talk about how we would love to see that one too someday. Both of us secretly wish we were Astronauts. One of highlights for all of us is seeing this SR-71 Stealth Blackbird. WOW! We pop into a tour group to listen to the stories of how this plane spied completely undetected at supersonic speed. What a sight to see for aviation enthusiasts! Since we are really just big kids (and there isn’t a line) we do the Wright Brother’s Flyer simulator video game. A very enthusiastic instructor shows us how two bar controls steer the original aircraft. It gives us some great insight into what it might have been like to fly in the early 1900s. We really enjoy our morning at the Dulles Air and Space museum and it is totally worth the drive out of the city. After lunch at Chipolte we drive back into DC to see the American History Smithsonian. We see the American Flag that inspired Francis Scott Key’s The Star-Spangled Banner. I remembered seeing this as a kid, but they had completely redone the exhibit and made it very powerful. You are not allowed to take photographs of the flag itself but this is what it looks like from the outside. An Apple IIE computer – Who else remembers using one of these!!!??? I just totally dated myself! My favorite part is all the ball gowns the first ladies wore. So pretty! To be politically fair and equal here is a beautiful red dress by both Michele Obama and Laura Bush. Both are so beautiful. I also love the ruby slippers from the Wizard of Oz. I watched the movie hundreds of times as a kid. We’re off to see the Wizard! The most sobering thing we see is this huge piece of steel from the World Trade Center. It gives me chills even looking at the picture. After an abbreviated tour of the American History Smithsonian we are MUSEUMED-OUT (Is that a real thing?) and want to do something entirely different. I love looking at history and art, but after a couple of days of museums, we are done! We drive back to Georgetown to explore. While Sarah and I do a little shopping (HOLY SHOPPING Georgetown! 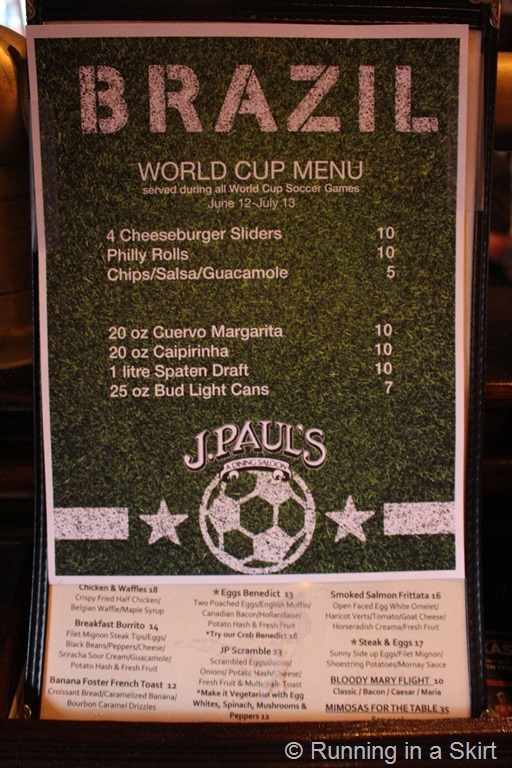 ), the boys hunker down at a historic bar to watch the World Cup. Team USA is in one of the early rounds. When Sarah and I finally return, look what they have waiting for us! These oysters are so tasty. After I watch my first World Cup game (I’m still a little confused by soccer, but it is warming up to me) and fill up on seafood we find DolceZZa Gelato, which is highly recommended by Beth. With flavors like black sesame, strawberry lavender and lemon ricotta cardamom we can hardly decide what to get. I eventually go for a big assortment including the lemon ricotta, strawberry lavender and a dreamy dark chocolate. I’m not sure it gets better than this! Bliss in a cup. After our sweet indulgence we realize that we missed some of the big sites that were on our must-see list. We decide to visit the Lincoln Monument and Jefferson Monument before we go to bed for the night. Our mistake turns out to be a good thing because the monuments are even more beautiful at night. First up is the Jefferson monument. Second we see the Lincoln Monument. We get a couple good pictures and I’m fading from exhaustion fast! This is where Martin Luther King Jr. gave his “I Have a Dream” speech. And Lincoln himself… The statue is so big in person. I’m really surprised at how crowded it is! Apparently locals like to see the monuments at night and take in the views. Just as we start getting really goofy and tired we decide to drive back to Arlington and call this Washington, DC trip a wrap. We head back to Asheville on the early morning flight the next day. Even though we jam-packed three days of activities into our trip I feel like we didn’t even scratch the surface on fun things to do in DC! I’m looking forward to heading back to visit Sarah and Beth as soon as possible. Have you been anywhere cool this summer? If you have been to DC, what was your favorite part? I loved the ballgowns on display. They were beautiful! And the location of the I Have a Dream speech. I have some great (daytime) photos from that spot. We only spent a couple of days – and one day was running a half marathon – so we didn’t quite to get to see everything you covered! I would completely flip seeing a space shuttle in person! It looks massive! My dream is to go to the American Museum of History. I’m such a history nerd and would probably spend all day there. It is so cool! I spent so long just in the section with all the First Lady dresses! That sounds like a great race. I am going to put it on my racing to-do list! I think racing or running through a city is a really fun way to see it.